The story of Dinosaur Jr is one of your classic rock tales of formation, disintegration, reformation and vindication. Formed in 1984 with J Mascis on vocals and guitar, Lou Barlow on bass and Murph on guitar, they were in the right place at the right time when the 90s rolled around and fuzzed-out stony rock was in. Mascis combined thick walls of high-gain guitars, unforced melodies and a wild lead style which seemed to say ‘I’m not ashamed of being a killer soloist but I’m going to do it my way.’ Barlow was booted in 1989 and went on to big things with his side-band Sebadoh. Things seemed to be going great for Dinosaur Jr when they signed to a major label in 1990 and they had a dream run for a few years, peaking with the single ‘Start Choppin,’ which did big chart business especially in the UK. But after the tour for the Where You Been album Murph jumped ship too, leaving Mascis as the only original member, and the Dinosaur Jr name was officially retired after 1997’s Hand It Over CD. After spending some time out on his own with J Mascis & The Fog, Mascis and Barlow started talking again in 2005. A new album, Beyond, arrived in 2007 and now here we are in 2009 talking about Farm, a return of sorts to the sounds of the Where You Been era. We’re talking fuzzed out guitars tones, ringing chords, wild solos and powerful melodies. 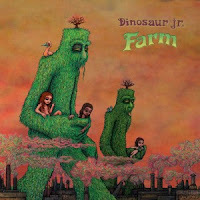 What’s made Dinosaur Jr so great over the years is the undercurrent of pop songcraft bubbling just below the surface. Not pop in the FM radio sense, mind, but in the ‘great melodies and unforgettable hooks’ way. Mascis is notoriously difficult to interview. That doesn’t mean he’s a stroppy primadonna or a jerk – nope, he’s just famously guarded and reserved in his answers. He obviously prefers to let his music do the talking. 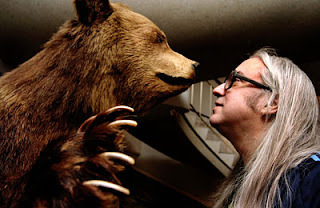 In the 90s one of the American guitar magazines figured that the best way to get an animated interview out of Mascis was to take him on a tour of pawnshops and guitar stores, bring along a camera and tape recorder, and shout some vintage guitar gear for him. It worked: Mascis opened up and revealed himself as a guy who just wants to create, and who has a deep love of and respect for classic guitar gear. CLICK HERE to buy the Fender J Mascis Artist Series Jazzmaster Electric Guitar Purple Sparkle from Music123.